The Nigerian MP who headed an inquiry which found that a fuel subsidy scam had cost the country $6.8bn (£4.2bn) has been charged with corruption. 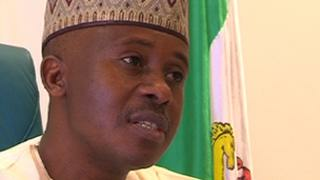 Farouk Lawan is alleged to have collected $500,000 of a $3m bribe solicited from an oil tycoon to drop his company from the investigation. The legislator pleaded not guilty in court and was taken into custody until a bail hearing on 8 February. His supporters say he is being targeted by those implicated in his probe. Nigeria is Africa's leading oil producer but has to import most of its fuel. Last year, Mr Lawan chaired the House of Representative committee that produced the fuel scam report, accusing some of those who import fuel of massive corruption. It called for a total overhaul of the oil ministry and for the prosecution of companies and some powerful individuals who had benefited from the swindle. The investigation was set up in the wake of angry nationwide protests in January 2012 after the government tried to remove a fuel subsidy. The oil billionaire, Femi Otedola, has alleged the lawmaker demanded the $3m bribe in order to have his company, Zenon, removed from a list of those involved in the scandal. Part of that money was handed over and a video recording of the transaction was given to police, he said. "You Farouk Lawan... in the course of your official duty corruptly asked for the sum of $3m for yourself from Femi Otedola... to afterwards show favour to Femi Otedola," Reuters news agency quotes the charges read out in the Abuja High Court. Another member of Mr Lawan's parliamentary fuel subsidy committee, Emenalo Boniface, was also charged in court on Friday with corruption for accepting $120,000 of the $3m bribe from Mr Otedola. Mr Lawan has said he accepted the money in order to expose blackmail and informed the committee and the anti-corruption agency, the Economic and Financial Crimes Commission (EFCC), about it. But the committee's deputy leader says he was not informed and nor did he receive any of the money. The EFCC has not commented. The initial fuel subsidy report said Zenon owed more than $1m to the government. Legislators later voted to remove the firm from the final report. Mr Otedola is a close ally of President Goodluck Jonathan and a major financier of the ruling People's Democratic Party. The BBC's Bashir Abdullahi in Abuja says as it is illegal to give as well as take bribes in Nigeria, some people have asked why Mr Otedola is not also facing any legal action. But if Mr Otedola was acting as part of a sting operation for Nigeria's intelligence agency, the State Security Services (SSS), as he has claimed, he will not be charged, but may be called as a witness, our reporter says. The SSS has not commented.